Industrial epoxy flooring is winning fans in an incredible number of different locations. 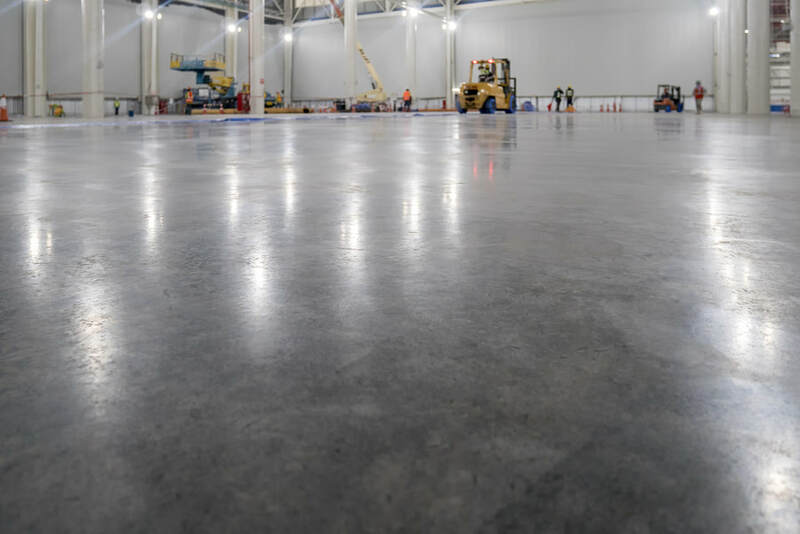 From hospitals to the food industry, schools to aviation hangars, the good looks, low maintenance and durability of epoxy surfaced concrete has become the flooring of choice for heavy duty industrial flooring. Easy to clean and providing longer life and better appearance in installations where cleaning is not frequent, industrial epoxy floor coatings also have the benefit that where they do get damaged or degraded they can be renewed with a simple re-coating process. So come and talk to Jacksonville Epoxy Pros about why epoxy is the way to go for industrial flooring. While they need a fairly smooth sub floor to adhere to, epoxy floorings are quick to apply which can be a big bonus in an industrial situation that will have to stop operating during the re-flooring process. Jacksonville Epoxy Pros will clean your old floor and grind to smooth if necessary then apply your new epoxy flooring surface. We are experts in assessing concrete sub floors and treating them so that they are ready for an epoxy finish that will bond perfectly and ensure a long life for your beautiful new surface. You've probably admired epoxy flooring already. That luxury car showroom with the glossy colored hard floor? That's one. That fitness center with the tough hard floor marked out with patterns and pitch markings. That's another. Epoxy coatings can be any color you like or can be patterned. That means they can be used to mark out walkways around industrial installations, forklift routes, entrances, exits, hazard areas, loading bays or crossings. You have pretty much all the design possibilities of paint but with the toughness of concrete. Epoxy flooring surfaces are also popular in industrial usage due to multiple safety factors. They can be heat and fire resistant and can be made to be non-skid in areas where you expect vehicle or foot traffic. They are easier on the wheels of delicate equipment too – one of the reasons why they are so popular with aircraft hangars but that also extends the life of your warehousing trolleys and vehicles. Epoxy floorings are also chemically resistant which makes spills, including oil, much easier to deal with and less likely to leave any kind of mark. Which is why they are a popular choice in medical and food installations. Epoxy floor coatings are some of the most hard wearing surfaces you can have underfoot but we know they are also often some of the most hard working too. The nature of epoxy means they are less likely to get marked or stained, and the fact that an epoxy floor surface is perfectly seamless gives dirt, liquid spills, and germs with no place to hide. They can be wiped clean, and easily washed – when you can that is. Because we also know that many floor surfaces in industrial use won't get the regular cleaning they perhaps deserve, and frankly a lot of customers choose epoxy flooring because it keeps on looking good even when that's the case.